Argiope aurantia is a showy spider usually noticed in late summer. 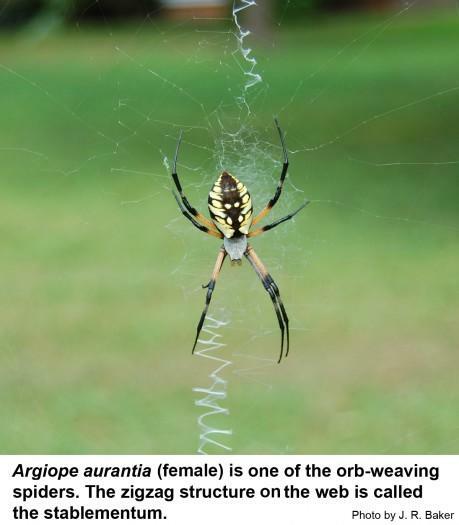 It has several common names: black-and-yellow argiope, black and yellow garden spider, corn spider, golden garden spider; golden orb-weaver, writing spider, yellow garden argiope, yellow garden orb-weaver, and zipper spider. The bodies of females grow to a little more than one inch long; the males are much smaller. The segment to which the legs and mouthparts attach is covered with very short, shiny, white scales. The abdomen is egg-shaped and conspicuously marked with black and yellow. Females spin orb webs (spiral sticky threads suspended on non-sticky spokes) with a conspicuous white zigzag structure in the middle called the stablementum. Spider experts disagree about why these spiders spin stablementa. Earlier the stablementum was thought to give stability to the web. Now the thinking is that the stablementum attracts insects or keeps birds from flying through the web. All spiders are carnivores that prey primarily on insects. 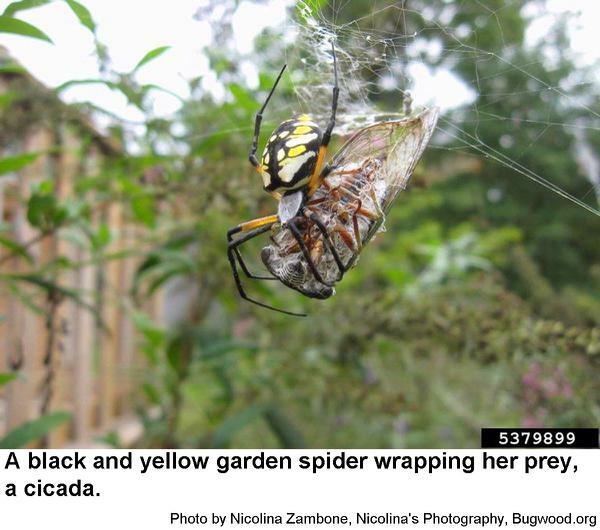 Black and yellow garden spiders find their prey by sensing vibrations in the web. They eat anything that doesn't tear itself loose from the web. At night, females consume the sticky strands of the web and spin new ones. It is thought they gain some nutrition from minute insects and even miscellaneous organic matter caught in the web. After mating in late summer or early fall, females lay several hundred to a thousand or more eggs inside a brown, silk, spherical cocoon about an inch in diameter. The spiderlings hatch but do not emerge from the cocoon until the following spring. Unfortunately for them, parasites and predators, including birds, prey upon these hapless spiderlings so that only a few survive the winter and even fewer survive to become adults the following season. There is one generation per year. The black and yellow garden spider. Male black and yellow garden spiders are smaller and more slender than females. 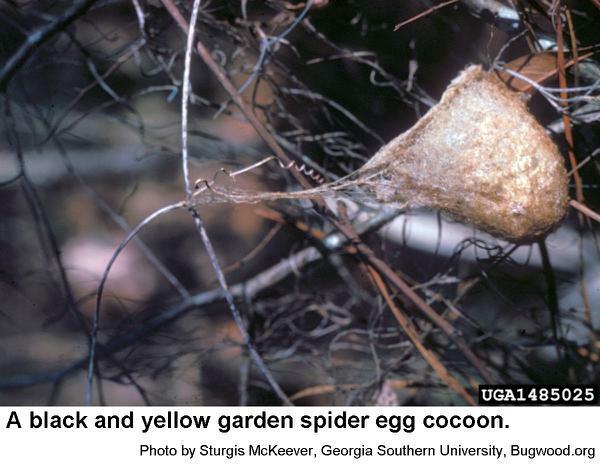 A black and yellow garden spider egg cocoon. Black and yellow garden spiders usually build their webs in fairly open areas as opposed to dense shrubs or inside shelters. Because all spiders are carnivores that feed primarily on insects, their presence helps rather than harms landscape and garden plants. This cicada appears to have torn away part of the web as it struggled. 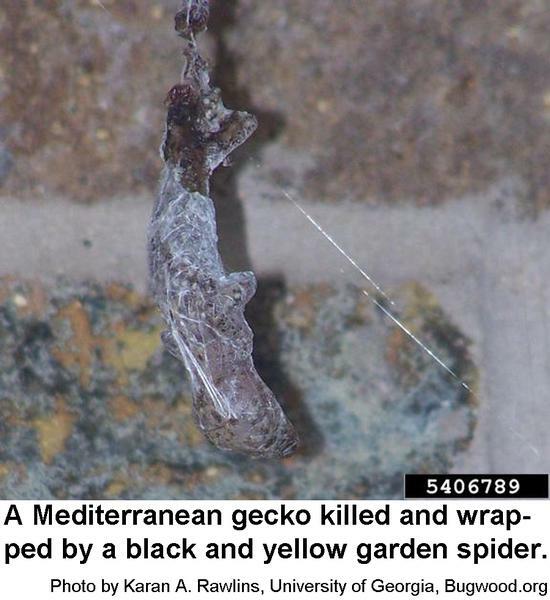 It is impressive that a black and yellow garden spider could overcome a small lizard! Black and yellow garden spiders are not aggressive toward humans. It might be possible to induce one of these spiders to bite, but the spider would probably have to be handled carelessly for that to happen. Because black and yellow garden spiders are considered to be beneficial arthropods, no control is necessary. 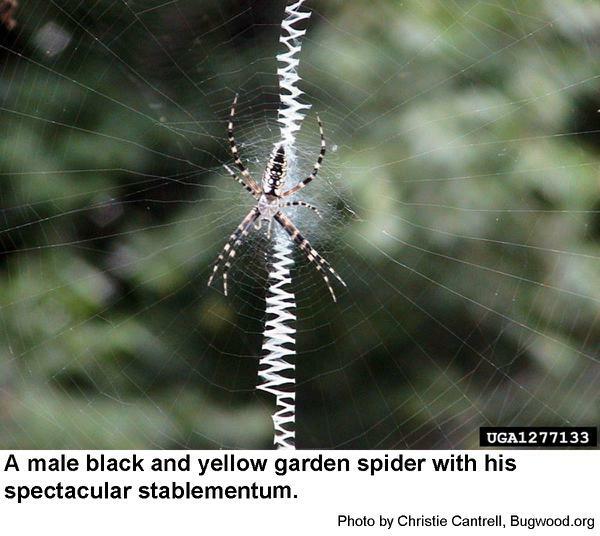 A Black and Yellow Garden Spider Spinning Her Stablementum. Cottingham, G. R. 2017. Video. Argiope aurantia. Hammond, G. 2002. Animal Diversity Web. Black-and-Yellow Argiope Spider. Hawkinson, C. 2006. Galveston Co. Master Gardeners Beneficials in the Garden. Spiders in and Around Homes. Waldvogel, M. and C. Apperson. 2008. Biting and Stinging Pests, NC State Extension Publications.